So, not a great workout, and not a good sing-along, but I was amused. 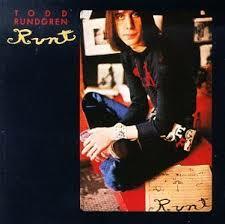 Yes, he’s an amusing guy, that Todd Rundgren. P.S. No memories pop into my mind from this album, but just try listening to “Can We Still Be Friend” and not come up with some. P.P.S. Rundgren trivia: he, like Joe Walsh has performed with Ringo Starr’s all-star band, was responsible for getting Meat Loaf produced, and pretty-much raised Steven Tyler’s daughter Liv.